Our clients have a strong affinity with Sweden. Their children are being brought up bilingually. Buying their first house together in Blackhall made a lot of sense with a family on the horizon and while the houses can be a little cramped there is always room for expansion. At briefing stage, their storey board lent heavily on contemporary Scandinavian architecture – a route natural to us. 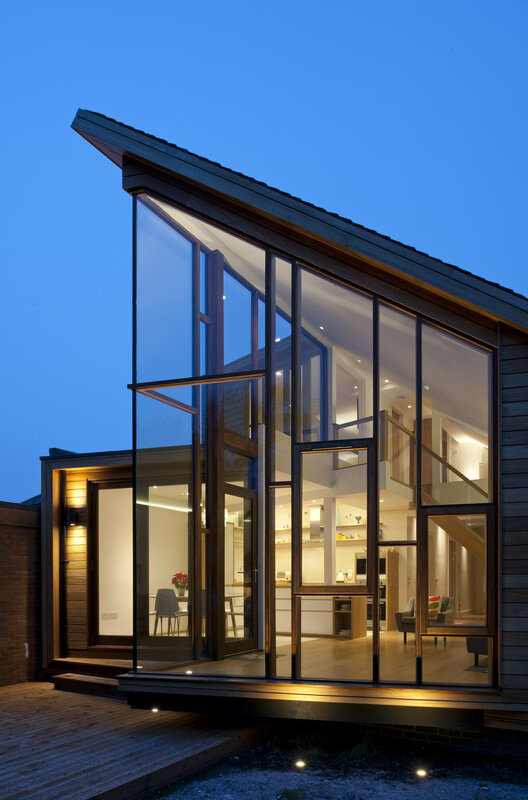 The form of the extension was developed to catch the sunlight from early morning and throughout the day and finally reflect the last of the evening sun down into the living space off the vast sloping ceiling plane. The extension and use of the attic space more than doubles the floor area of the house. The large internal volumes of the project required to be dynamically modelled to satisfy planning overshadowing policies. The reflex angles give order and control to the plan form while addressing views and key sun angle. The 5.1M tall frameless glazed corner cantilevers out over the garden giving a lightness to the massing. The extension is not apparent from the street side of this semi-detached house. The slate covered roof and timber clad north wall shield family life from the elements and neighbouring properties. The expanse of glass welcomes in the sunlight and reveals views over the large garden towards the wooded slopes of Corstorphine Hill.